How well can you read? Good enough? Somebody at City Hall desperately needs your help. These obnoxious signs were installed at the train station last week. Not only are they ugly and obtrusive, parts of the text are a lie. Apparently City staff expects nobody to double-check their work. “NO Loitering” — Hello? This is a train station where people are encouraged to loiter while waiting for their train. What’s worse is the code citation, FMC 17.105.020, is completely bogus because Title 17 doesn’t exist in the municipal code. The City doesn’t even have a “no loitering” ordinance that would apply here. Somebody made this up! “NO Handbills” — They cite FMC 7.30.030. Funny, the title of Chapter 7.30 clearly says this part applies to “Private Residential Property” (see below) which the train station obviously is not. No person shall accost any other person in, or on, any public place, or in, or on, any place open to the public for the purpose of begging or soliciting alms or soliciting donations in exchange for a token service that has been provided or promised. I took the liberty of drawing circles with a radius of 50 feet from the Amtrak office, Spaghetti Factory, and Santa Fe Express Cafe. Good news for solicitors, despite the new signs posted all over the place, about 75 percent of the train station is still fair game! 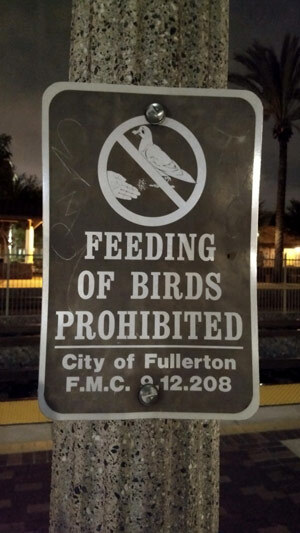 Last, but not least, don’t feed the birds! A real shocker, I know, but FMC 9.12.208 on the sign only applies to Parks and is worded for the protection of waterfowl. This isn’t enforceable at the train station. 1. “Waterfowl” means and refers to any ducks, geese, or other birds which can be found in a restricted area, which have used a restricted area as a habitat, or are reasonably capable of using a restricted area as a habitat. 2. “Restricted area” means and refers to any publicly owned lake, pond, stream, creek, fountain, or body of water in the City of Fullerton, including, but not limited to, Laguna Lake. What’s the point of this exercise? To prove just because the City makes a sign, or assures us something is true and correct — that more often than not — they are wrong. I know you’re reading this [new City Manager] Ken Domer. Now would be a great time to take a stand against the perpetual incompetence that emanates from all levels of City government. Your predecessor, Joe Felz, had no problem doing things poorly. Will your tenure be marked by more of the same? I think the point is also that the city tolerates perpetual incompetence and nothing ever gets fixed right. Tolerates? It’s their stock in trade. When are we going to start having a decent and educated personal. I did not finish highshcool. I should apply for a job on the city hall . I will probably qualify for a good paid job with out education like a lot of this people. The sign went up to make it easier for the cops to chase junkies out of the station. Since none of them can read, it doesn’t make a difference. Now that I think about it, the junkies can’t read either. Nice work, Curlee. I wish you would post more often. David Curlee, your expectations are unrealistic. City employees need time to read this blog on city time. They don’t have time to actually check their work. And they aren’t that smart. I agree with Facts Is Facts. The residents need you to keep the city honest because clearly they can’t keep themselves honest. I wish to commend the author for bringing this problem to light. This topic brought about much grief and anger during my working days. Complaints to the attention of Armstrong, Meyer, and McKinley, a total waste. Fell on deaf ears. They did nothing. I once cited a teenager under the FMC. Wasn’t that big of a deal. I was surprised it made it to court. Walked into the courtroom. The girl was there sobbing with her parents at her side. The judge wasted no time throwing it out. I relied on a city sign like those pictured to write the citation. The code and section was wrong. The ordinance didnt even apply where the sign was posted. I assumed in good faith the sign was properly placed. And accurate. The joke was on me. Yes. I felt awful and embarrassed. Afterwards I apologized profusely as the girl was clearly traumatized being in court. Watching the brass pretend to care was the biggest frustration working for the City. I presume nothing has changed. Since you were surprised that it made it to court the question now is how many officers used those same signs to write illegal tickets which were then paid. Ignorance of the law is never an excuse. Unless you are a city sign maker, a cop or the dumbass city attorney. NO harassing legal businesses in order to steal their property. NO more corrupt, abusive and ignorant cops, etc. That property is owned by the City. Any signs on it are placed there by the City. Likewise the platform is owned by the City and no fence means major liability. At least the City finally got that right. The Santa fe CAFE and comic book store and platform are owned by the city … public records show it is leased ..
You’ve uncovered a vast conspiracy, my friend. Here’s a trip: The birds aren’t even real. SO MANY CAPITAL LETTERS! MAKE ME SO HAPPY! What do you do if your back itches? T-REX IS SOCIAL ANIMAL. HAS MANY DINO FRIEND. YOU SCRATCH T-REX BACK, T-REX NO EAT YOU. No, the sign says PLEASE don’t. It also says “thank you.” And there is no threat of arrest or fake citation from the FMC. You are an idiot. There is another sign that you missed . Right on the ramp from spagehtti factory is a sign on the rail that says ” Do not lock bikes here. ” A few years ago somebody locked there bike and apparently hopped on the train and left it locked there for about a week. As a frequenter to this area and familiar with employees here I have to say many of the restrictive actions are a result of the whim of one amtrak emplyee who takes too much interest in whats going on around the train station and yes even the bus terminal area peaks his curiosity. It was this person who’s complaint went unchallenged and had about nine benches cut out right at the east entrance of the station about six months ago only because one homeless lady was sleeping there overnight. The bird signs went up a few years ago because one homeless lady would feed pengeons occassionaly on the end of the platfrom away from most patrons. The problem is that these were isolated incidents and not continuous problems. I believe the suppressive actions discouraging the enjoyment of this historic landmark is due to the mismanagment of underperforming Amtrak employees. Any day of the week you can walk in the station and smell what smells like dirty dipper smell. It radiates from the restrooms that amtrak emplyees are never seen cleaning. Even with outdoor public portable restrooms they refuse to let customers in unless being buzzed in. Many times no amtrak people are available at the window at night which means no access to restrooms. They blame the homeless of course for not cleaning. They used to have service workers but that stopped about the time an incident occured and related to one male Amtrak emplyees was fratenizing a female worker trying to rack up her hours of service work. There really hasn’t seemed to be much problems with the homeless in the recent past on the platform which confuses me about how the most recent signs went up. Most of the problems with the homeless are in the new SoCo parking structure area inluding the benches and bike locker areas. The platfrom has been relatively problem free for quite awhile. These signs do nothing to give a good empression about our city to travellors. Please remove these ugly menacing signs! A committie should decide on the placement of signs not just the whim of 1 or 2 persons who are not in touch with the dynamics of this unique location. Amtrak, another public entity. Nixon, the environmentalist, began federal funding of Amtrak to encourage people to take the train instead of cars thus reducing pollution. Yet, population quadrupled since 1972, and so have the cars in California. Another green politician, California Governor jerry Brown, is still pushing through the bullet train . What gets pushed instead is a privately funded enterprise, Amtrak, philosophically resembles the apathy of the snivel servant. 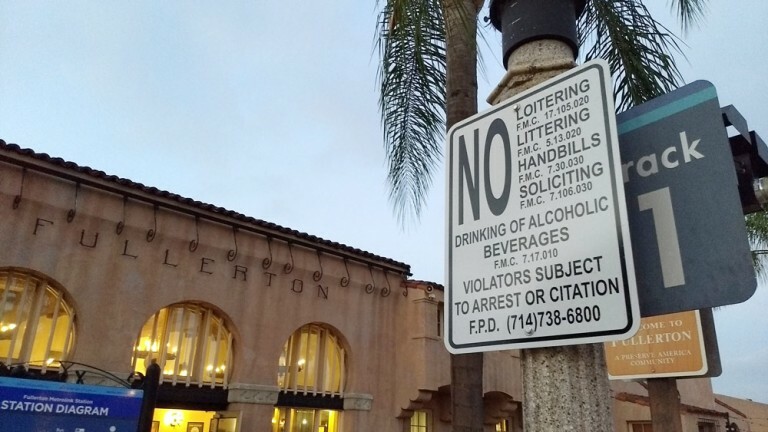 the above sign reflects more on the mentality of FPD and Fullerton city council than it does on the public. 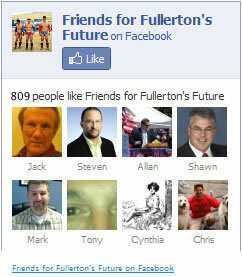 When Cicinelli gets his job back with back pay, Fullerton will be the laughing stock of California law enforcement. Oh wait, you already are. And yet the elevators are not installed. Nice priorities. I wonder if they ever will be. The contractor finally installed steel piles for the foundations – what, two years after the contract was let? City Engineer, Don Hoppe, the inveterate liar isn’t done coming to council while hiding the true cost of this boondoggle. The signs at the train station are now all taken down.Just noticed identical signs pasted to the pillars of the SoCo parking structure either just put up or left to stay. the signs make sense now as they appear to be originally designed for the problems in the parking structure. The No handbills refers to the canvassing of cars nightly on weekends. Drinking, littering, these are real problems in that structure. Why these same signs were also placed around the train station area also is just lazy planning as the logistics there aren’t anything like that of the bar district SoCo parking lot. I wonder if the fake muni code citations are gone.